Babylonian Talmud, Tractate Eruvin, with the commentary of the Rosh, the Rambam's commentary on Mishnayot and the Maharsha. Slavita, [R. Moshe Shapira Rabbi of Slavita, and son] R. Shmuel Avraham Shapira, 1836. This Talmud volume was printed in autumn 1836, at the height of the famous polemic between the printers of Slavita and those of Vilna, and it is the last volume of this edition to be printed. It is also one of the last volumes printed in the Slavita printing press before its tragic closure. This volume is part of the fourth edition of the Slavita Talmud, of which only the printing of Tractates Berachot, Shabbat and Eruvin were completed (in the middle of the printing of Tractate Pesachim, the press was shut down by the Russian authorities, following the infamous libel). 23 letters and approbations are featured at the beginning of the volume, from leading rabbis of the generation who supported the Slavita printers, including: R. Elazar Löw – author of Shemen Roke'ach, R. Avraham Abele Poswoler Rabbi of Vilna, R. Yaakov Orenstein Rabbi of Lviv – author of Yeshuot Yaakov, R. Shlomo Kluger Rabbi of Brody; as well as Polish Chassidic leaders – Rebbe Yitzchak of Warka, R. Shraga Feivel of Gritza, R. Chaim Meir Yechiel of Mogelnitza (the Saraf of Mogelnitza); R. Aryeh Leibush Lifshitz of Vishnitza – author of Aryeh Debei Ila'i (son-in-law of the Yismach Moshe and father-in-law of the Rebbe of Shinova), R. Eizik of Homel – leading disciple of the Baal HaTanya. These letters and approbations contain much exclusive and valuable information on the development of the famous polemic, in which some two hundred rabbis of that generation were involved. 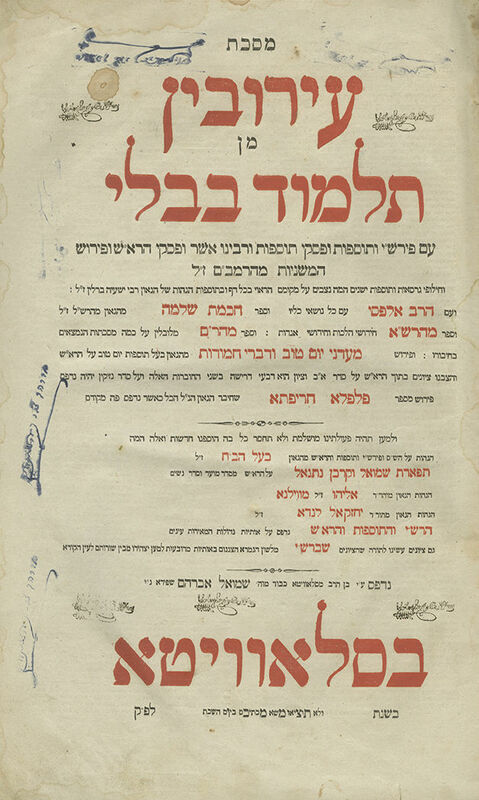 During the course of the polemic, the Vilna printers propagated a rumor which alleged that the rabbis backing them had issued a prohibition and excommunication on whoever would buy the Slavita Talmud. In light of this, the Slavita printers asked the rabbis supporting them to cancel this prohibition (if it was ever enacted). The rabbis and rebbes responded with the letters printed at the beginning of this volume, in which they contend that not only was there no prohibition, on the contrary, they extend an abundance of blessing, in material and spiritual matters, to whomever would buy volumes of Slavita Talmud: "The buyers… will be blessed with all good, and will merit to see sons and grandsons alive and well, engaged in our holy Torah… life, peace and all good in comfort for the worship of G-d" (the Saraf of Mogelnitza); "Whoever steps forward to purchase this Talmud from the Slavita printers will be blessed with an abundance of blessing… sons, life, sustenance and all good" (author of Aryeh Debei Ila'i); "Those who fill their hand for G-d to acquire the Slavita Talmud… will be blessed with the blessing of good, will receive blessing from G-d from Heaven… and will become wealthy through the blessing of G-d, and they will merit to study, and to see their sons and grandsons studying G-d's Torah in comfort" (Rebbe Shraga Feivel of Gritza); "Whoever is wise-hearted will grab a good deed to awaken his ear in study, to purchase the Slavita Talmud… those who study in this Talmud edition… and those who buy it, will merit to have the light of Torah illuminating their eyes" (R. Aryeh Leib Horowitz Rabbi of Stanislav). On the front endpapers: "This Gemara belongs to the glorious wealthy man, R. Nechemia son of R. Moshe Krasotski of Lublin". Other stamps and ownership inscriptions on the title pages and other leaves. , 2-132; 17,  leaves. Two title pages. Title page printed in red and black. 38 cm. Good condition. Stains, dampstains. Original leather binding, partially covered with fabric, torn and detached.